Ensuring racial equity is just one of many issues with the possible ballot measure that to be settled by May. As Metro ponders a regional affordable housing bond to put before voters next year, an advisory committee is wrestling with a thorny question: how to guarantee that minorities will benefit from it without shortchanging low-income whites. The 32-member stakeholder advisory committee is charged with developing the values that will govern spending of the bond funds. It includes a mix of public, private and nonprofit officials involved in housing issues. 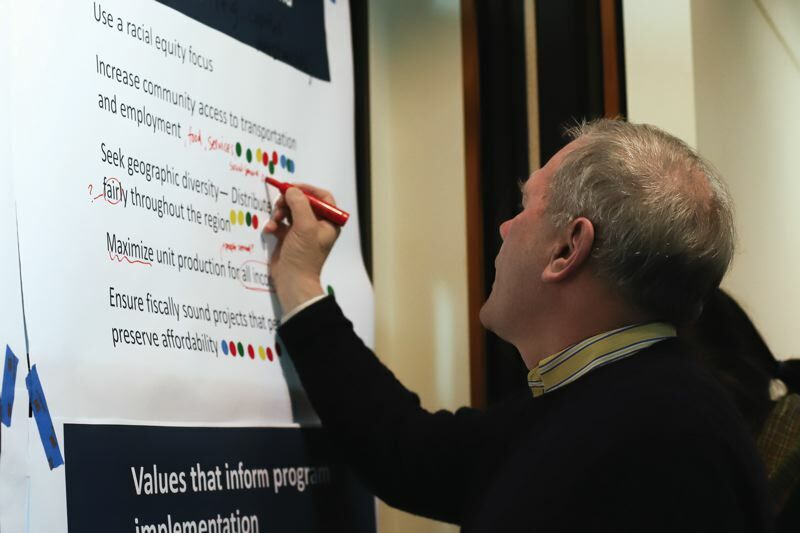 Everyone at last Wednesday's meeting at the regional government's headquarters agreed that racial equity should be the top priority. "Race is the single most important fact in economic disparity. 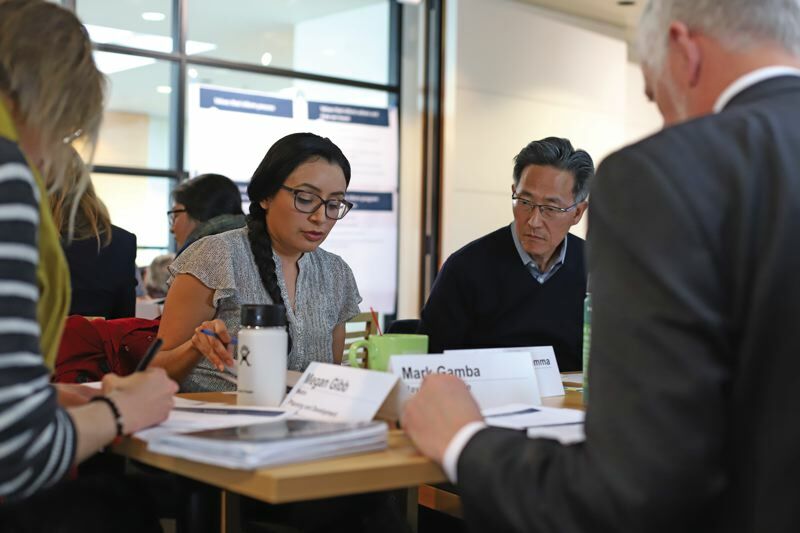 Metro should lead with racial equity," said Allan Lazo, executive director of the Fair Housing Council of Oregon, at a Feb. 21 meeting at Metro's headquarters. Without disagreeing, a few other members asked what that would mean for Clackamas County. It has fewer minority residents than Multnomah or Washington counties, but still has pockets of poverty. The discussion was complicated by the fact that Metro has not yet offered a single definition of racial equity. At the end of the meeting, Metro Chief Operating Officer Martha Bennett said the subject deserves "a meeting of its own, not just 20 minutes of a larger meeting." According to Bennett, that issue and everything else about the measure must be decided by late May. The deadline is necessary to allow her to finalize it in time for the Metro Council to decide in June whether to refer the housing bond to the November 2018 ballot. Other decisions range from the amount of the bond to how the money will be spent by the governments within Metro's jurisdiction. Some are being discussed by other committees appointed by Metro. All of the decisions must be made in June to meet state election deadlines. Such discussions also surrounded the $258.4 million affordable housing bond measure approved by Portland voters at the November 2016 election. But most of them happened after the election. Mayor Ted Wheeler has been criticized for appointing a committee that took seven months to write the framework for spending the money. More than a year later, the City Council has approved only one project since he took office in January 2017. Metro wants the spending framework for the measure to be written first. But, as the two-hour meeting showed, the issues to be resolved are no less complicated than those faced by Portland. "If the measure passes, a year from now, a small group of officials will be deciding whether to buy a piece of property based on the values we are setting," said Lazo, who also serves on the committee reviewing the spending of Portland's bond money. Metro President Tom Hughes announced his government would pursue a regional affordable housing bond measure last November. At the time, Hughes cited a recent poll that suggested Metro voters would support a $500 million property tax bond. The actual figure has not yet been determined, however. "This poll confirms what housing advocates, renters, seniors and others have been saying for far too long — housing should be an urgent priority for local leaders," Hughes said on Nov. 14. "Private developers and nonprofits are not getting the job done alone. It's time for our community to come together and do more to ensure seniors, veterans, families and working people can afford a place to call home." Hughes made the announcement the day after Metro took responsibility for a regional transportation funding measure from TriMet. The transit agency had been planning to place a $1.7 billion measure on the November 2018 ballot to help support the new MAX line proposed for the Southwest Corridor between Portland, Tigard and Tualatin. It ran out of time to finalize a list of other transportation projects in the region to win the support of voters living outside the corridor. Metro is now planning to place such a measure on the November 2020 ballot. At first glance, an affordable housing measure should be easy to sell to voters within Metro's boundaries, which roughly correspond to the urbanized parts of the three countries. As Hughes said, the poll shows homelessness and affordable housing are top priorities in the region. And Portland's measure passed with nearly 63 percent of the vote, an impressive margin for any tax measure. But there are several reasons why Metro is proceeding cautiously. For starters, Metro has little experience developing affordable housing. It has mostly helped support mixed-use projects along transit lines with some affordable units, officially known as transit-oriented developments. Portland is also the most liberal city within Metro's borders, with a history of approving more tax measures than other jurisdictions. It was the only jurisdiction to approve a transportation-related tax in recent years — the temporary 10-cents-a-gallon gas tax that passed at the May 2016 election. Voters in Tigard defeated a similar tax that November. Voters in Clackamas and Washington counties defeated motor vehicle registration increases over the past few years. And voters will know Metro is planning to ask for a regional transportation measure in two more years. Discussions about it with other governments in the region are already underway. The Washington County Commission gave it mixed reviews during a Jan. 16 briefing by Metro staff. Some voters might decide they'll support it instead. And if that's not challenging enough, Metro likely will not be able to say exactly how the money will be spent during the campaign to pass it. That is because it is hoping the 2018 Oregon Legislature will put a measure on the same ballot, giving it greater flexibility. At this time, the Oregon Constitution restricts local governments from partnering with private businesses on construction projects financed by voter-approved property tax bonds. The restriction was approved by state voters in the 1800s to prevent corruption. But it conflicts with how governments traditionally fund affordable housing projects. Most are supported by a mix of private and nonprofit partners, with governments contributing a relatively small share of non-bond tax dollars. The restriction is forcing Portland to totally finance and own the projects funded by its affordable housing bond. Although the city promises that 1,300 units will be preserved or built with the money, that is far fewer than would normally be supported with $258.4 million in city funds. A proposed constitutional amendment to ease the restriction is expected to be considered by the 35-day session of the Oregon Legislature that is underway in Salem. But Metro will not know if the amendment will pass before it finalizes its affordable housing measure. So most likely it will have to offer voters two different options for spending the money during the campaign. If the amendment passes, much of the money could be distributed to cities and counties within Metro's jurisdiction, which could then partner with businesses and nonprofits on projects. If it fails, most of the money would probably go directly to the housing authorities in each county. The options were described as scenarios A and B at the Wednesday meeting. The committee is scheduled to meet again in March to continue its discussion.